Earn More with Our Channel Partner Programme. Your Success is Our Success – We believe that success is best enjoyed when shared. Throughout the past 31 years, we have worked hard to build, manage and maintain our network of over 275 channel partners. These relationships are something that we take very seriously and we make sure that we provide all the resources our channel partners require – including second-to-none sales and marketing support. The ProcessFlows Channel Partner Programme allows our partners to grow their portfolio to include a range of platform-independent, best of breed products, with minimal risk and investment. We offer competitive margins and excellent revenue streams and you can use our infrastructure and client services to maximise every sale. 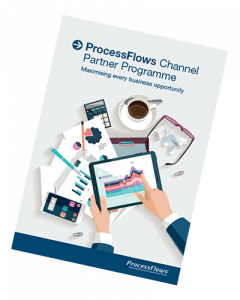 Tailored to suit your business models and markets, the ProcessFlows Channel Partner Programme provides a framework to help you expand your portfolio, develop your experience, grow the business, retain customers and increase profits. Once the agreement is signed, a framework is followed, making sure that you have received sufficient product training and are happy with how the Programme works. ProcessFlows will then provide you with all the necessary sales tools and support. A team focused on ensuring your success and building a positive relationship between your organisation and ours. Newsletters, product announcements and updates, and company communications, in the form of emails as well as partner seminars and webinars. Online, on-site and workshop training courses and tools are available, to enable your sales team to identify and create opportunities. Experienced account managers provide assistance in customer meetings, demos and information requests. Fast and effective quotation system. SLA for quotation within a maximum of 24 hours. We run incentive schemes and campaigns to reward Channel Partners for their commitment and achievements.